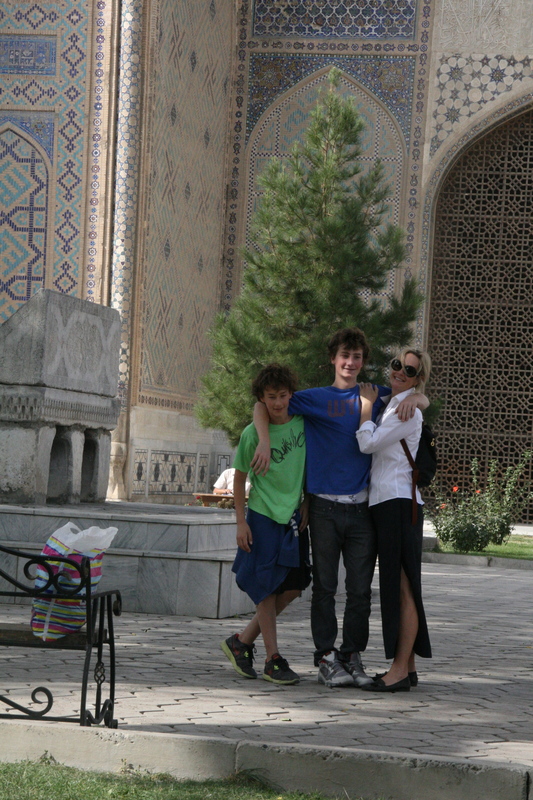 After school last Friday we jumped on a plane and headed off to deepest darkest Uzbekistan, expecting an off the beaten track adventure. While it may be off the North American track, the first part of our trip was in a land of blue hairs, bus tours and bad buffets. All of which I loathe, particularly now that the boys think John and I will soon be joining their ranks… we are getting SO old! Most of our fellow tourists are from the former USSR or India and Pakistan. We are greeted in every hotel not by our name but as “ah, the Canadians”. We are the only people traveling with children. In an effort to avoid the buffets I am always asking guides and drivers to take us to local restaurants. No buses, no tourists… no English! Ordering is a challenge as the menus are in Uzbek and Russian. Uzbekistan is one of only two land locked countries in the world completely surrounded by other land locked countries… there is no fish to be had. We are eating a lot of pretty chewy lamb and beef and some amazingly flavorful chicken. The tomatoes are too die for, and we eat them breakfast, lunch and dinner. Sadly, our experiment with local food has left each of us at one point or another completely debilitated with a vicious attack of Timurlame’s revenge. (Timurlame was born here and we visited his mausoleum on Monday). Always uncomfortable it is doubly so because the available toilet paper is not the soft type kittens play with in adverts but more like the crepe paper one uses to decorate for kids parties. Slightly more pliable than sand paper. I shall never boast about my cast iron stomach again! 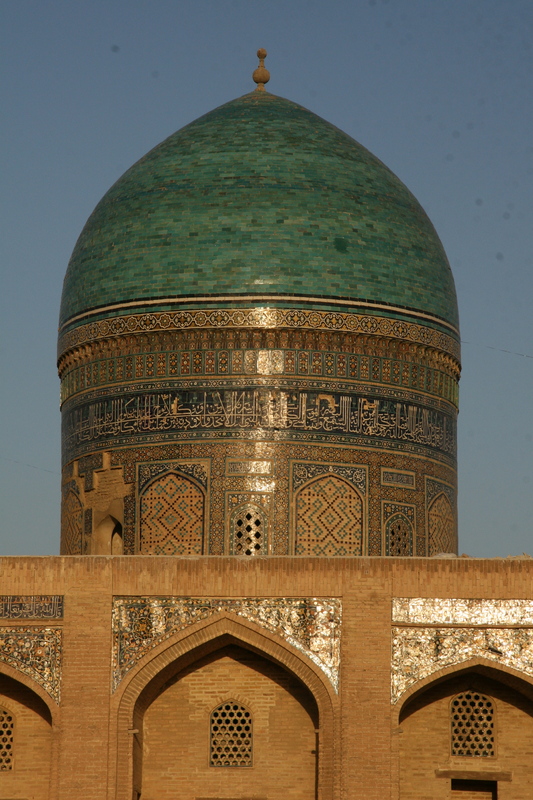 Uzbekistan generally tops lists as having one of the world’s most corrupt regimes. Turns out corruption has its benefits. For a shockingly small payment we have been able to climb up two ancient minarets that are officially closed to the public (one 12th c, and one 14th c). 140 well used, cracked and uneven steps up and again down, lit only by small holes in the metre thick walls. All three boys ran up like mountain goats. I clung to the walls, stepping carefully and took forever… listening to the echo of the boys asking John “do we really have to wait for Mom!” The views have been phenomenal, looking down into the mosques and medressas and across the stunning countryside. I have been fooling myself that yoga and walking are keeping me fit, must get on a stair master. My legs are killing me! For all my bitching, the sites are truly spectacular and the people so kind and welcoming. 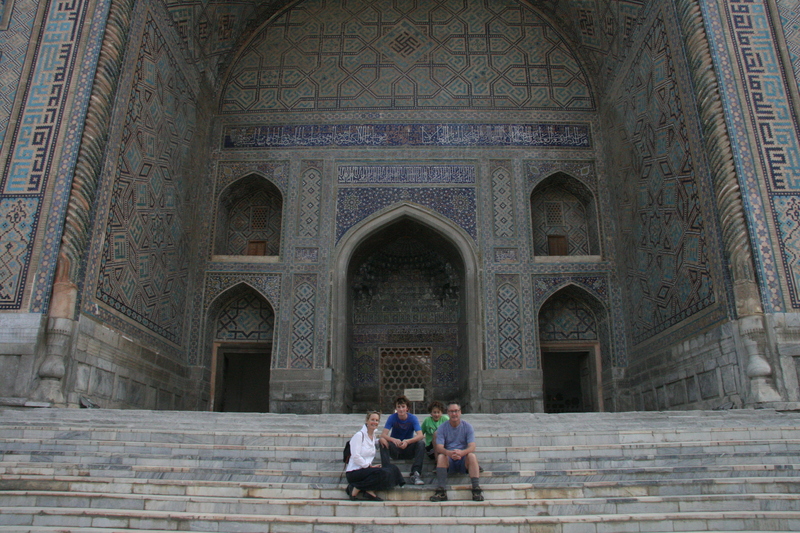 Uzbekistan is filled with Islamic holy places and we cross paths with lots of religious pilgrims. They always invite us to join them in their prayers, giving me the best spot on the women’s side. They want to be photographed with us, and there is a lot of giggling, grins and handshakes all around! While I grew up thinking of the USSR as the enemy, and Stalin as the worst of the worst, he spent a fortune restoring this country and all its jewels. Uzbekistan did not choose independence but had it given to them in 1991 by Gorbachev, whom they hate. When the Russians left so did most people’s pensions, healthcare and schools. Sadly, the people in charge didn’t really change. The current president has held the post for 20 years and before that he was a senior minister in the old government. Although he is “elected” the elections have been labeled completely unfair by every outside organization. Dissent is ruthlessly suppressed. Even more wonderful that the sites, I am enjoying our long drives between places. It is here that you get a feel for the real people. It is harvest season, and universities and religious schools have been closed so all students can join in cotton picking. There are hectares and hectares of cotton fields. The Soviets planted them, but cotton needs too much water for this desert climate. There are huge environment costs and water is getting increasingly scarce. Cultivation methods are quite primitive and the rural areas very poor. People picking, donkeys carting and the occasional overloaded tractors. We wave back and forth with the farmers and everyone shares wonderful smiles! Our last three days have been spent trekking through the mountains. Much more challenging than we imagined and finally, well off the beaten track. We were not prepared for the weather, nights down around 0 degrees and days up in the high 20s… (Celsius!). We brought neither jackets nor sunscreen. The mountains reminded me of New Mexico and are breathtaking in their austerity. The boys were in their element and showed such enthusiasm for putting up tents, gathering wood, building huge fires and even leading the donkeys that helped carry some of our gear. Delightful to see they could have fun with out electronics. Can’t tell you how much I am looking forward to sleeping in a soviet era bed tonight, hard and lumpy as it is. It is a sheer heaven after tossing and turning in the freezing cold trying to get comfortable on the very solid ground. Back to Beijing tomorrow on the red eye!